We all know the feeling of Mondays dragging on for what seems like forever. 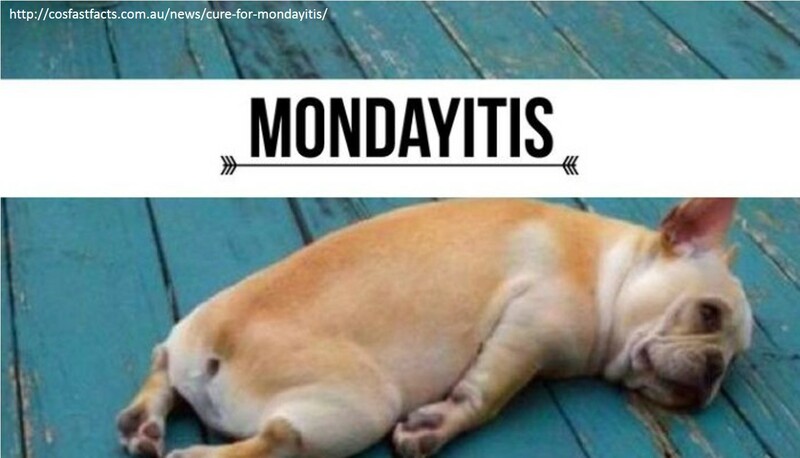 But is Mondayitis an actual condition – or are we just wingers? The theories for causes of feeling slack & unmotivated on Mondays are wide-spread. This includes over indulging on the weekend, causing the liver to work extra hard to get back to a stable level. The differing life schedules that the weekend creates breaks our usual sleep, eating & work cycle causing more lethargy on Mondays. One theory is Interior Design based – with the 1960’s & 70’s adopting office building set ups filled with plastic based furniture & fixtures. These toxins from the plastics are released into the air, but with the buildings being closed over the weekends, the concentration of toxins ingested on Mondays gave the occupants a much more lethargic feeling than any other day. Sick Building Syndrome does actually exist & this could be a cause of your feelings or physical state when at work. If you do feel a certain way in your office, consider What is around you, When did this feeling start & How it makes you feel. New carpets, fresh paint & plastic furniture can all have toxins being released. Good air flow helps to remove the toxins & indoor plants have been found to be great air filters to give you more clean air. They are also very in vogue right now as well. If there is nothing new, consider old items – bad lighting, damp areas, poor ergonomics or constant noise. Inadequate lighting can cause headaches after hours of squinting or straining to see. Consider different forms of light, such as adding a desk lamp & moving it around during the day to get the most workable light. Some buildings can be old & have drainage issues. Dampness in offices causes mould & spores to be thrown into the air. This can give respiratory issues & make you feel unwell. You may find this more during damper months, & not so much in summer. Poor ergonomics are a huge issue in offices. Slouching, sitting crooked, looking down at your monitor & poor mouse clicking can cause plenty of back, shoulder & neck problems. Fixing your desk space & replacing your chair to focus more on ergonomic support will help immeasurably. Also make sure that you get up regularly to take breaks from the screen. A change to your working environment may make all the difference to your physical & emotional state during the work day. Of course, if you do all these things & still find that you feel lethargic, especially moving through the rest of the work week, you should consult your doctor to ensure it isn’t another issue. And from a mental point of view – one theory to break the Mondayitis is to love what you do. This empowers you through the whole day & gives you a purpose to the hours you spend there. To take the edge off a Monday you can pre-plan your work week on Sunday night to have a clear focus moving into your Monday morning, or if possible, finish work early on Mondays & do something you enjoy like walking the dogs or reading a book. It will make the start of the work week more enjoyable. If all else fails – maybe just grab another coffee & hope for a better Tuesday!